Construction and big machines are book themes that are in demand by a number of young children (or their parents). They are not always easy to find, although I have come across more of them than expected recently, full of building sites, diggers, and men and women at work. Construction Zone is a tour of a big construction site that explains how building works, beginning with the architect who draws plans and makes models. It requires excavation, lots of workers who wear special protective clothing for safety, and foundations to make the building strong. 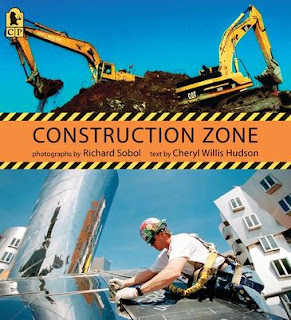 Dozens of colourful photographs by Richard Sobol illustrate the construction process. They were taken on a large, real-life construction zone over a three year period. Snapshots of the steps needed to make a building, and which are hidden by the time it's complete. Cheryl Willis Hudson has written accompanying text which complements the photos. The roles of different workers like carpenters and masons (bricklayers) are explained, as is the job of the machines like cranes and structures like scaffolding. There's lots of detail covered, including installation of insulation and the long cables, pipes and wires. The final product, a bright shiny new building, is seen sitting among others in a cityscape, no longer a construction zone. If you have a budding young builder or designer in your family, make sure you dig out a copy of Construction Zone for them.